Still recovering from the effects of a 26-year civil war that ended in 2009, Sri Lanka is now seeing hopeful signs that one of its deepest wounds – the relationship between the police and the community – is improving. During the war, police were often preoccupied with counter-insurgency and national security. As a result, mistrust between communities and the police force grew, particularly in the North and East where police often viewed community members as potential threats to security, as opposed to a constituency they serve. For years, much of the interaction between the general public and the police has occurred at police stations when citizens reported a crime and at vehicle checkpoints, where most identity checks are performed. But, with the end of the war in 2009, police service is gradually making the shift from a “securitized” form of policing to a community-oriented one. As part of its larger institutional reform initiative, the leadership of the Sri Lanka Police Service (SLPS) is set on making the police a more professional and “people-friendly” service. As part of this initiative, 43 cities and towns in the North, East, South, and Uva have over the last eight months introduced bicycle patrolling to improve community-police relationships, deter petty crimes, and offer citizens the opportunity to interact with police officers positively in public places. 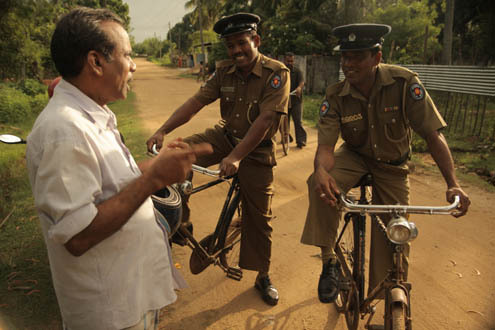 While patrolling has historically been a part of the Sri Lankan policing system, community policing emphasizes the importance of engaging with citizens while on patrol to become better known throughout the community, stay informed about local activities, and be available to receive complaints or give advice. Recently, the deputy inspector general of Uva Province told me that he has found bicycle patrolling to be a cost-effective and efficient way to increase access and mobility of the police to more remote areas, which often lack roads that can be navigated by patrol cars. With greater interaction with communities, the police are also able to gather information about local crime and conflicts and identify “hot-spots” so that they can increase patrols in those locations. Some community members who we interviewed said that they are now able to not only access the police during routine patrols, but also avoid the daunting task of visiting police stations to report crimes. In northern Vavuniya town, since November 2011, 12 police officers have been assigned to the more populated parts of town for bicycle patrolling. Local sergeant Gunawardena said that he along with three other police officers bicycle through the densely populated lanes and by-lanes of the market area of Vavuniya town from two in the afternoon to 10 at night. Since the end of the war, cases of petty theft have been on the increase in Vavuniya, due in part to better reporting and the return to normal policing functions, including investigation of complaints lodged with the police. 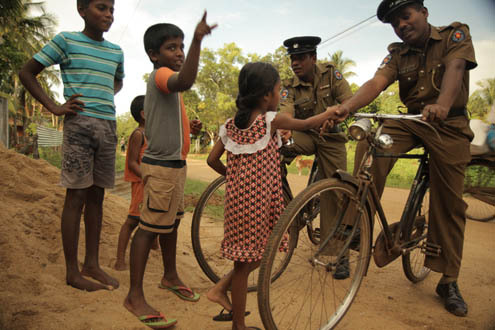 The Inspector of Police, Ranatunga, who leads the bicycle patrol project in Vavuniya, said he believes that as a result of regular patrolling, fear of crime has reduced among citizens who now feel a greater sense of safety and security. Local citizens and police interviewed in Vavuniya agreed that conducting bicycle patrols helps develop relationships, deter petty crimes, and offer citizens the opportunity to interact with local police officers. The deputy inspector general of Uva Province recalled a story from earlier this year of three constables who were cycling down the main street in Buttala town late evening as part of their regular patrolling routine. The bus en-route from the capital, Colombo, stopped at the bus station on the way to Moneragala. A single passenger got off the bus, and seemed shocked upon seeing police constables around. Noticing his uneasiness, one of the constables approached him. Before they could strike a conversation the passenger pepper-sprayed the constables and tried to run away. However, alert onlookers caught him in time. When he was taken to the police station, the officers realized that he was part of a small criminal gang and was planning operations in the area, which the local police were able to intercept, thanks to the bicycle patrols. With Sri Lanka’s tumultuous war-time period over, and the once highly securitized environment relaxing, this initiative allows the police to rebuild their relationships with the community, instilling trust and confidence among citizens that they can provide them with safety and security in their day-to-day lives. For more information on the bicycle patrolling initiative, watch a video, produced by The Asia Foundation in partnership with the Sri Lanka Police Service with the support of the British High Commission, on the Sri Lanka Police website. Gita Sabharwal is The Asia Foundation’s deputy country representative in Sri Lanka. She can be reached at gsabharwal@asiafound.org. The views and opinions expressed here are those of the individual author and not those of The Asia Foundation. Bicycle cops are a good start! To learn more about community policing and police improvement, read my new book and visit my blog, “Arrested Development: A Veteran Police Chief Sounds Off About Protest, Racism, Corruption and the Seven Steps Necessary to Improve Our Nation’s Police.” My blog is at http://improvingpolice.wordpress.com/ where I discuss these and other current police improvement issues. Good luck and may we all experience not just good but great policing in both our countries!